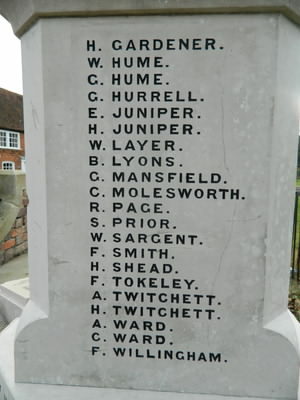 Click on this to see a photograph of the War Graves Commission Memorial. Private Royal Army Service Corps. Bures, then moved to Parkeston. Son of Bamard and Mary Cudmore; husband of Eleanor Cudmore, of Speedwell Terrace, Bures St. Mary, Suffolk. Native of Mount Bures, Essex. Son of Josiah and Jane Diggins, of Mount Bures, Suffolk. Walter William Dixie born Lamarsh then to Bures. 27 Jan 1917 Flanders. Herbert enlisted in August 1915 and therefore an 'under-age' soldier. (being just over 16 and a half years old. Son of Samuel and Clara Francis, High Street, Bures. Son of Harry Juniper, of Nayland Rd., Bures St. Mary, Suffolk. His brother Harry Juniper also fell. son of Martha Layer in Colchester Road. 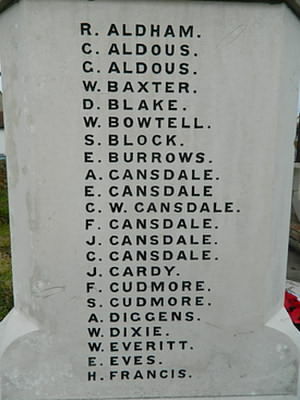 husband of Ada Lucy Lyons, of "Sunnyside," White Colne, Essex. Served in India nine years with the 1st King's Dragoon Guards. Clarence Bell was born in Sudbury around 1893, the son of Mrs. L. Gager, formerly Bell, of 51 St. Margaret’s Street, Ipswich. 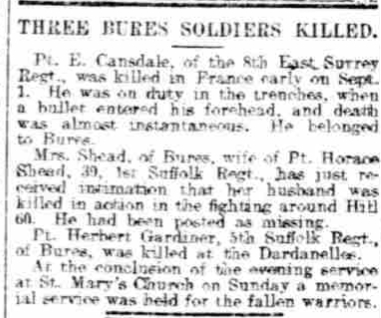 Clarence was living in Bures, when he enlisted in Braintree, Essex. 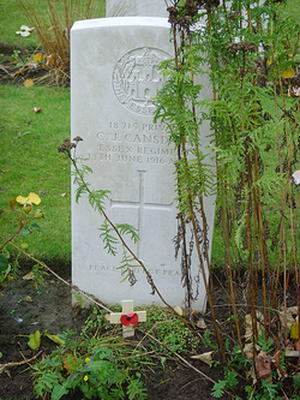 Clarence died aged 21 on 23rd October 1914. There is no known grave and he is remembered on the Ploegsteert Memorial, near Ypres, Belgium. Sgt. 1st Battalion Cambridgeshire Regiment, 12th Division, buried: Ribemont Communal Cemetery Extension, Somme, France. 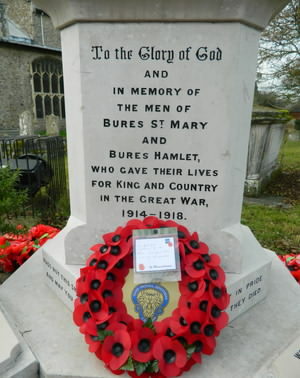 Born Bures, Suffolk, enlisted Sudbury, Suffolk.